Twelve Stones Christian Academy (TSCA) is a nondenominational, biblical-worldview, Christian school serving Northern Kentucky. The school is an outreach of Answers in Genesis in partnership with Renewanation to provide excellence in academic education. TSCA was successfully launched in 2017 with Kindergarten through 7th grade. As each year passes, we will be adding on an additional grade until we reach 12th grade. What does it mean to be a discipleship school? It is the philosophy of TSCA that children need to be trained in wisdom and in the admonition of the Lord so they can learn to excel within a biblical worldview in science, apologetics, history, and all other subjects. This effort is to prepare them for the world’s attacks as well as for evangelism (Proverbs 1:3-5). Thus, we hope to attract like-minded families who want their children trained to be defenders of the gospel and missions, as opposed to those assuming their children are already thoroughly equipped to defend their faith. Because children of this generation are influenced by secular media, programming, museums, peers, and in some cases secular education, we need to prepare and train them to have discernment to counter false humanistic religion. We want to guide children down the correct path (Proverbs 1:15). We cannot assume that our children are already experts on discernment and evangelism; they require delicate training in both the Bible and academics to be equipped for every good work. Thus, discipleship and preparation of children are our primary goals so that as these children prepare for adulthood, they will then be prepared to present the gospel and defend the authority of the Bible with confidence. Why the name Twelve Stones? For those familiar with the book of Joshua, the name “Twelve Stones” should call an image to mind. When Joshua led the Israelites into the Promised Land, they had to cross the Jordan River. The Lord led the Israelites just as He had promised into the good land that the Lord was giving them as an inheritance. The Lord cut off the waters of the Jordan that came down from upstream, and they stood as a heap (Joshua 3:13). The Israelites crossed the river on dry ground. The Lord commanded Joshua to tell the Israelites to take twelve stones out of the midst of the Jordan and carry them over and leave them where they lodged that night (Joshua 4:3). These are the school verses: Joshua 4:21–24. The name Twelve Stones Christian Academy is to be a reminder of what the Lord has done and continues to do. It is a reminder to train the next generation what the Lord has done, whether in Genesis, the gospel, or what the Lord will complete at the final Consummation. 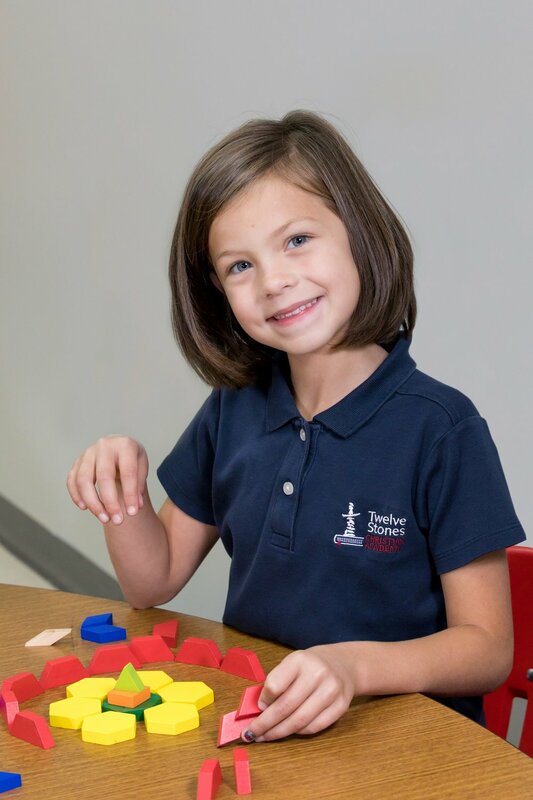 What makes Twelve Stones Christian Academy unique? Twelve Stones Christian Academy is designed to be a school that integrates a biblical worldview in every subject taught (Romans 15:4; Philippians 4:8). We begin with the Bible as the absolute standard and final authority in all matters, not just faith and practice. We are unashamed of this fact. As a Protestant school, we uphold the doctrines of the Christian faith as delineated in the Scriptures alone. All authorities outside of Scripture are lesser authorities. Scripture is supreme and profitable for doctrine, for reproof, for correction, for instruction in righteousness, that we may be complete, thoroughly equipped for every good work (2 Timothy 3:16-17). Along with the gospel, TSCA also places a strong emphasis on a literal 6-day/24-hour day creation and biblical authority. The Bible is inspired, inerrant, infallible, sufficient, and authoritative. Thus, we stand on this in our teaching methods and we make creation, general apologetics (i.e., defending the faith), and salvation a priority. We also have a Curriculum Review Committee that rigorously evaluates Christian textbooks and supplements to see what should be used and best aligns with the philosophy of the school.